Move over strawberries – chocolate has a new date this Valentine’s Day! I first tried the combination of chocolate & raspberry about five years ago while on a dinner cruise in Montreal. It was delicious! If you think chocolate with strawberries is yummy, just wait until you try chocolate + raspberries. Mmmm! Sometimes (and by sometimes, I mean always) I crave something sweet after supper. I try not to keep too many sweets in the house but I usually have chocolate chips in the pantry. The other night I was craving some sort of melted chocolate dessert so I came up with this super easy Chocolate Raspberry Panini. My first thought was to use slices of cake as “bread” for this dessert but that was a crumbly mess. My second try was using cinnamon raisin bread & it worked out perfectly! You could grill this in a panini press or just heat it up in the frying pan until the chocolate melts. One sandwich is more than enough for two people. A big scoop of vanilla ice cream on top would be delicious too! 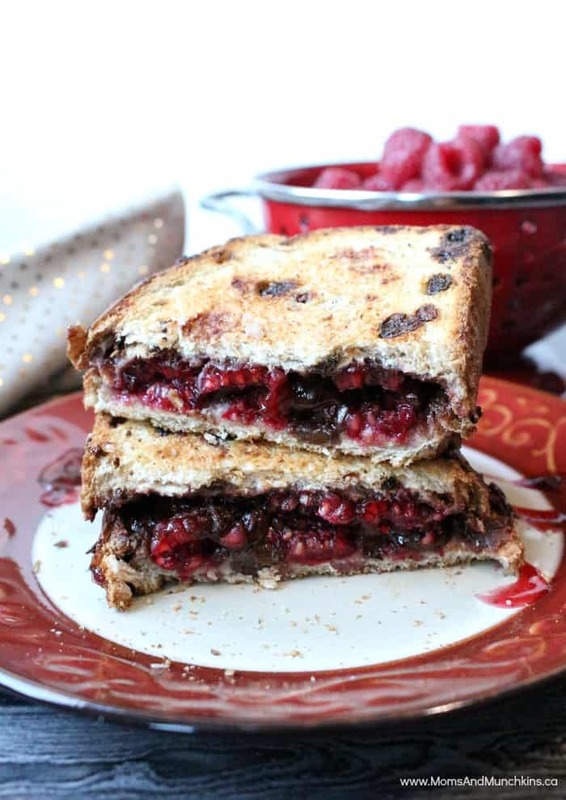 Spread raspberry jam on one slice of bread and then sprinkle chocolate chips on top. Lay raspberries evenly over the bread then place the other piece of bread on top to make your sandwich. Heat in a panini press or frying pan until the chocolate has melted. This is super messy to eat so I’d recommend using a fork instead of just picking it up with your hands. Either way, you’re going to need extra napkins. For more sweet treat ideas, visit our Recipes page. We’re always adding new ideas – follow us on Facebook, Pinterest and Instagram for the latest! What a fantastic dessert idea! I love that you used cinnamon raisin bread. I can’t wait to try it soon. Thanks for sharing!